One of the more unlikely rock stars of its first decade, Rhodes brought impeccable credentials built over a twenty year career before he ever stepped foot into rock ‘n’ roll. At an age when most were thinking of retirement, Rhodes entered a new field and not only competed with artists half his age, but thrived. 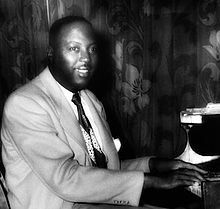 Todd Rhodes was born at the dawn of the 20th century and after studying music in college he first rose to prominence in the mid-1920’s as pianist for McKinney’s Cotton Pickers, one of the more popular jazz bands of the era. By the mid-1930’s the group disbanded and Rhodes settled in Detroit as a club act for the next decade. When rock ‘n’ roll came along in 1947 Rhodes was forty seven years old and twenty years past his first commercial peak. Signing to the small local Sensation label which only had distribution in Michigan and Ohio he cut a series of tight instrumentals with a crack band that stirred interest when they got national distribution by King Records in the summer of 1948, landing him two hits in the course of a year. Rhodes eventually was signed to King Records directly where he not only continued issuing his own solid records but also backed numerous female vocalists who performed with his group, Kitty Stevenson, Connie Allen and LaVern Baker, as well as handling sessions for a few other artists over the years. By the mid-1950’s he receded from the spotlight and after diabetes took a leg he retired from music and soon passed away in 1965 having briefly conquered two disparate musical genres in two distant eras.